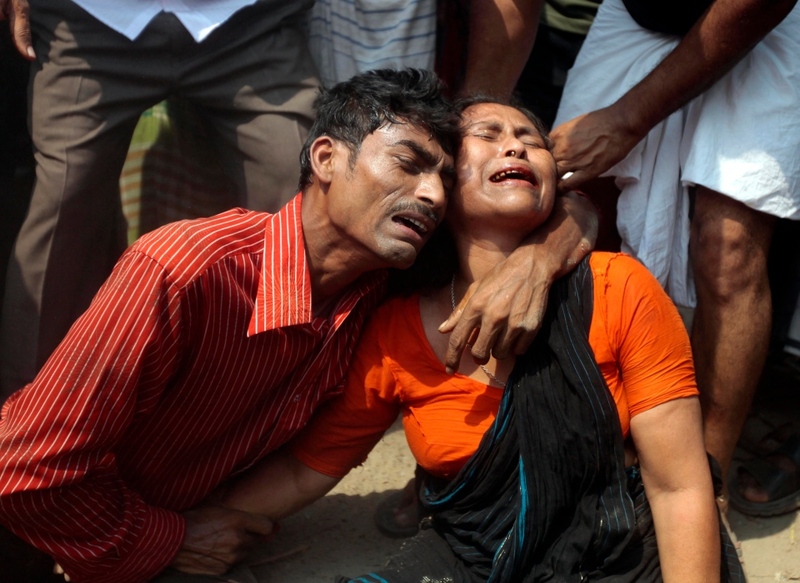 This morning I have stolen myself away from revision to spend a short amount of time writing about the recent catastrophe in Dhaka, Bangladesh. 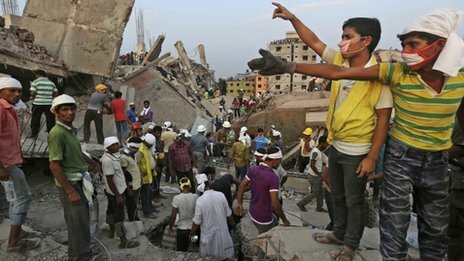 For others; the people still trapped in the rubble of the collapsed factory, the children who've lost their mothers and fathers, the people with no other option than to continue working in factories like this one, the disaster is much more of a reality. The link above will take you to a short video report on the BBC website, and what you see may (and hopefully) will shock you into taking a few moments to think about what you buy and where it comes from. The problem in the UK is that the public are all too happy to be ignorant about the production of their clothes, but not entirely through all their own fault. It is hard for people to find out what conditions their clothes are made in and which companies are ethically and morally correct, these days even the Internet contains false and unreliable information. However, it is general knowledge that the cheaper the clothes, the more likely they are to have been made in poverty stricken cities by people too poor to complain about the frightening standards they are forced to work in. 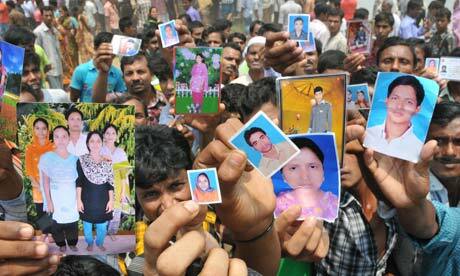 Primark (who were known to be using this factory in Dhaka) are no stranger to criticism when it comes to the production of their clothes, but after the scandal first blew up in the media a few years ago, the public were lead to believe standards in Primark factories had been raised and that under-age, underpaid workers were not being used. Clearly, the reality is not as Primark want us to think. 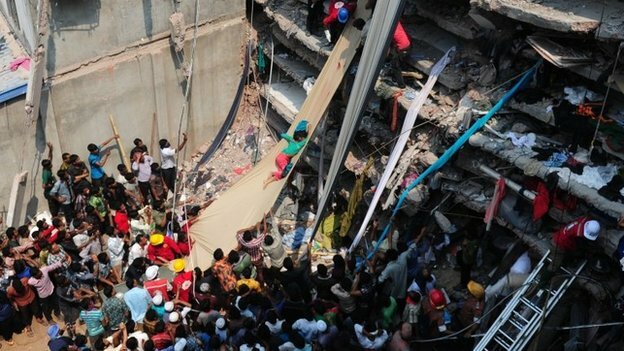 It is unclear whether Primark and Matalan, two of the shops known to be using the Dhaka factory, knew the building was unsafe as it is unclear what the owners of the factory told their investors when they found out about the cracks in the the buildings framework and were told to evacuate. However, is it not the responsibility of these businesses to regularly asses the factories they use to ensure standards are being met? I know that during my work experience at a London design and supply firm for places such as Next, Topshop and Asos, my supervisor flew out to China for an audit assessment on the factories used there. If Primark and Matalan carried out these duties as they are supposed to, would they not have found the standards in the factory to be lacking? And what about us? The public. Why is it that when bombs go off at the Boston Marathon killing three people (R.I.P), we mourn to the point where atheists are hash-tagging 'pray for Boston' but when over 250 people (with more dying every hour) are killed through our own indirect actions, we stay eerily quiet? Here is a tragedy, a news story, which the public have power and influence over. You can make a conscious decision whether to hand over money to companies that endorse the horrific treatment of the poor in their factories, allowing them to work in conditions that go on to kill them. I expect an overwhelming majority of the UK have bought things from shops such as Primark and Matalan, I know I have-but it's time for the UK public to take a stand. It is only by luck and chance that we were born in a democratic, wealthy country and not into poverty in Asia. We did not earn the right to be in such a wonderful country, but we are here, and we have power that we must exercise. The recession is making things increasingly hard in Britain, especially for those already in less wealthy circumstances. But at what point do we decide it is acceptable to support immoral companies at the expense of people just like ourselves in other areas around the world? Maybe you do need those new shoes, or that cute dress (I know that feeling all too well!) but what about saving for an extra few weeks to buy from ethical companies instead? What about jumping on the charity shop bandwagon? What about simply taking the time to find out if your favourite shops take care of their workers, the people who make everything you wear? A lot of people take the attitude of "Me not buying this top from Primark won't change anything" and to them I would ask how they thought society had got to the point it is at today? Every large social change starts somewhere. If Primark, Matalan and other companies knew their customers were not okay with these standards, they would be forced to either change for the better or watch their business fail. We all get it wrong, and it's not easy to spend more on less or boycott our favourite shops with our favourite prices, but I bet it's a hell of a lot easier than learning that your father is trapped between piles of concrete slowly dying because the UK likes cheap clothes. 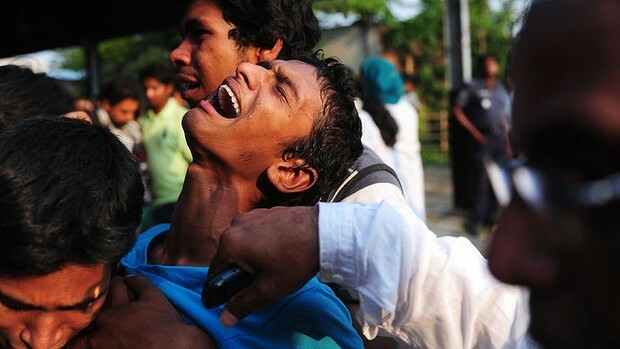 These factory workers pay the price that we save, this time with their lives. which i'm not sure whether they buy from these kind of factories. but toronto is seriously expensive and i buy from these places because of this!! i know it's not right though! great post! Well said. I too have noticed an eery silence on this subject, meanwhile the Primark hauls continue.